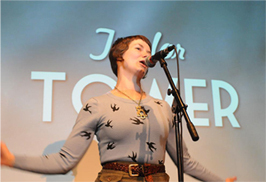 Taylor Tower is a writer, radio producer, performer and teacher based in Minneapolis. She grew up in Portland, Oregon and studied creative writing at Portland State University before moving to Montreal in 2006, where she co-produced and co-hosted Confabulation, a monthly storytelling series. She has performed in numerous storytelling events including Literary Death Match (Montreal), The Moth GrandSLAM (St. Paul), and The Moth MainStage (Denver). Her writing has been featured on CBC Radio One's WireTap with Jonathan Goldstein, nerve.com, Maisonneuve magazine, and Public Radio Remix, among others. She has taught storytelling workshops to students of all ages. Her storytelling heroes include Spalding Gray, Louis CK, Raymond Carver, Ira Glass, The Moth, 99% Invisible, Radiolab and you. For more information on workshop rates and availability, as well as one-on-one storytelling coaching, feel free to send an email.